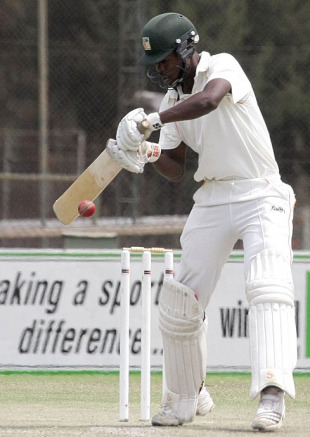 Mashonaland Eagles began their limited-overs competition with a comprehensive win over Southern Rocks at the Harare Sports Club. Their bowlers turned in a collective performance which kept the Rocks to just 151 for 9 in 50 overs. The Rocks, after being asked to bat, slipped to 50 for 6 at one stage but Tendai Chisoro, who finished unbeaten on 73, took the team past three-figures and ultimately past 150. He added 57 with No.8 batsman Trevor Garwe, but it was insufficient. Four Eagles bowlers - Tatenda Manatsa, Nathan Waller, Elton Chigumbura and Ray Price - picked up two wickets each. Regis Chakabva, the wicketkeeper, collected five catches behind the stumps. The Eagles were in early trouble in their chase, losing their first three wickets for just 16. But Sikandar Raza (43) and Forster Mutizwa took their team to 97. Mutizwa stayed through to the end, guiding his team home with a half-century, helping seal victory with more than 13 overs to spare. In Bulawayo, an all-round performance by Mountaineers helped them effect a comfortable seven-wicket victory against Matabeleland Tuskers in the Zimbabwe One-Day Competition. Tino Mawoyo and Kevin Kasuza, the two openers, put on 170 runs as Mountaineers chased down 212 in the 46th over after their bowlers took wickets regularly to restrict Tuskers to 211. Mountaineers, after opting to field, struck in the third over, removing Terry Duffin for 3. Although Tuskers didn't suffer collapses, they weren't allowed to build big partnerships. Besides the 94-run stand between Charles Coventry and Craig Ervine, the innings was based on small stands worth between 2 and 32. Prosper Utseya was the Mountaineers' highest wicket-taker with three wickets, including those of Ervine, who scored 62, and Coventry. Their openers, both of whom got out in the 80s, made sure the contest was virtually over after batting 38.3 overs to be separated, with 42 more runs to win. Two more wickets fell in the 42nd over, but Greg Lamb and Timycen Maruma ensured there weren't further hiccups.